We spend up to 60% of our waking hours at work. This makes the workplace a great place to introduce new habits and routines that boost health and well being. 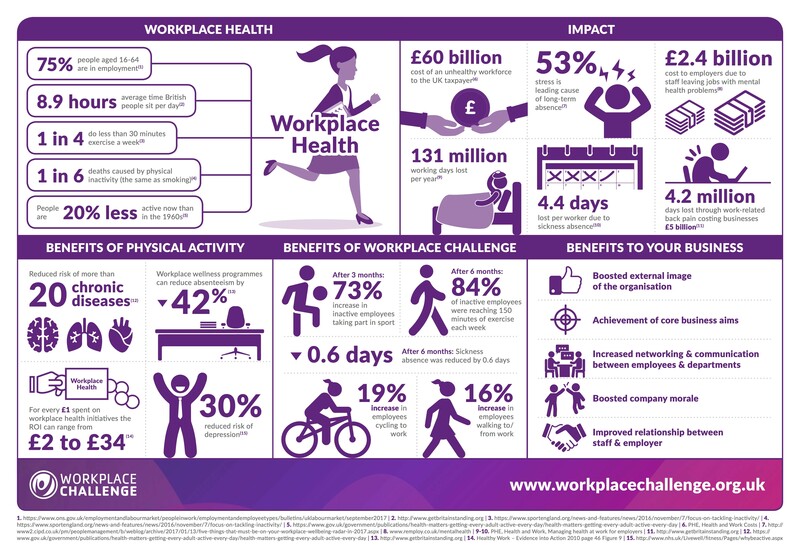 To make people aware of how physical activity can improve lifestyle and what the benefits of the workplace challenge are. The overall statistics and feedback from the workplace challenge 2018. This report compiles evidence of the impact and effectiveness of workplace health initiatives, building upon our original report produced in 2014. An independent review into how employers can better support the mental health of all people currently in employment including those with mental health problems or poor well-being to remain in and thrive through work. The second National Employee Mental Wellbeing Survey in partnership with YouGov, part of a three-year collaborative project with business and five national partners. A toolkit for employers informed by an evidence review produced by Public Health England. A document produced by the Mental Health Foundation. A document produced by the Mental Health Foundation, which outlines methods for managing and reducing stress. The Mental Health Foundation have produced a resource to help individuals manage their mental health at work, have an idea of how to reach out to a colleague in distress and how to work with others to make workplaces more mentally healthy for everyone.